Oh, Hawaii... how much we miss you, you don't even know! 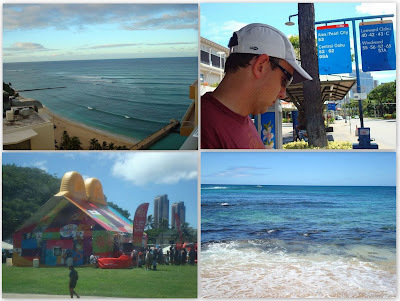 This was my third time visiting Oahu, and the first time with Mike. In October 2008, my family and I celebrated my sister's beautiful wedding on Waialae Beach Park, and we reunited with my other sis, Lani, who lives in Cincinnati, OH. I've never been on any other islands other than Oahu, and I've always had the best time whether I'm in Honolulu, Waikiki, or the North Shore. 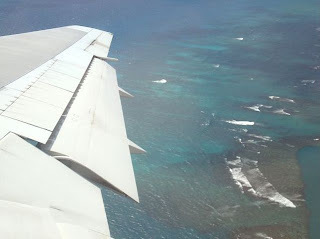 Hey, it's Hawaii, folks!!! We stayed at the ResortQuest Waikiki Beach Hotel, which was once Aston Waikiki Beach back when we were visiting in 2004, but now... it's back to being Aston Waikiki. 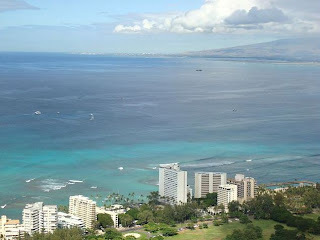 This is our absolutely favorite hotel to stay at in Waikiki because it has a great view of Diamond Head, it's across the street from Kuhio Beach, has an amazing view of the ocean, and four words...."Breakfast on the Beach"!!!! OK, so we were now in Hawaii and I wanted a plate lunch. I should have known better that I was stretching it when there wasn't an authentic plate lunch booth there, and found this at a Korean BBQ type stand, called Yummy Korean BBQ. 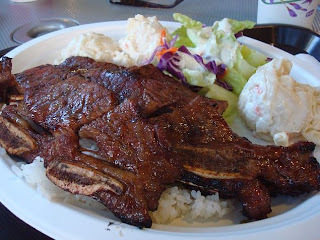 I got the kalbi ribs with steamed rice, and we had a choice of four, yes, four side dishes. They had kimchee, some bean sprout mixture, macaroni salad, lettuce salad, steamed corn, and other fun stuff *sarcasm*. I opted for triple mac salad and a lettuce salad with ranch dressing. Triple mayo salad was more like it. The meat & rice were good safe items, and that's all I ate of my plate. 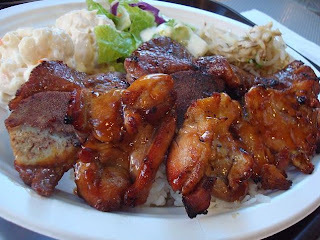 Mike got the combo plate, which was kalbi ribs and teriyaki chicken. He was adventurous enough to get three different side dishes (a double mac salad), but he ended up just eating the proteins and rice too. I almost wished I got an all-beef grilled hot dog like what Ron, my bro-in-law, got. It looked good. It was pretty pricey also... we payed over $20 for both of our plates and drinks. Our primary source of transportation in Waikiki, besides walking, was The Bus, which we absolutely LOVED. The following morning, after being insulted by an annoying cab driver who wanted to take us to the park, we took the bus to the Diamond Head State Monument. 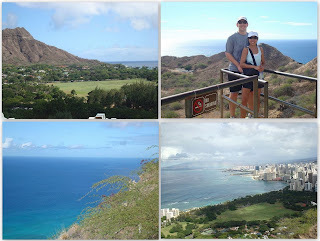 We hiked 0.75 miles up Diamond Head (volcano cone) and took in the breathtaking views of the city and the gorgeous ocean blue. 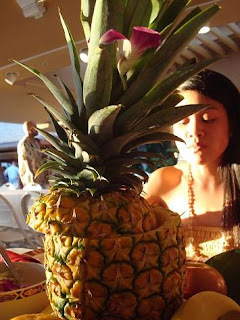 We had the pre-wedding dinner at the Hale Koa Hotel Luau that evening. Guess who is the regular host of the show... Glenn Medieros (who sang "Nothing Is Going to Change My Love For You"). Ah, takes me back to the 80's.... he did sing it at the end of the show. I waved my cell phone in the air - I really did. I wasn't the only one! A juicy whole pineapple staring me right in the face! The pineapple was very juicy, sweet, and fresh. 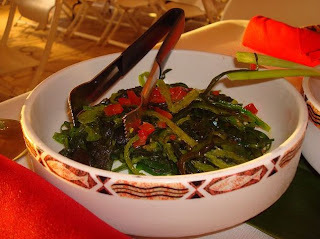 It was the perfect appetizer for my tummy! I could have eaten the whole thing by myself. Slurp! Mmm... my plate of meat, an assortment of different proteins. 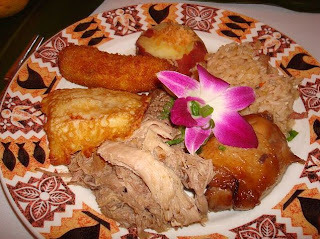 Kahlua pig, mahimahi, shoyu (soy sauce) chicken, teriyaki beef, served with fried rice, sweet potato, and banana fritter. Everything was tasty - yum! My mom and I joked around about getting more rice from the kitchen, since they only gave a little portion. We were entertained with amazing traditional island dances, a hula contest between males (of course), honored the proud military who is serving and is retired (my daddy - go Navy! ), and celebrated the couple who has been married the longest - sweet, huh? We called it a night, and took a cab ride back to the hotel. 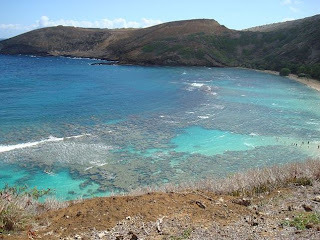 Hanauma Bay - snorkeling fun! Mike and I walked "a couple streets" down (according to my sis) to Snorkel Bob's to rent snorkeling gear. A couple streets turned out to be a good 20 minutes, about a mile away from the hotel. We finally made it to the bay via bus, and met my two sisters, my nephew, and bro-in-law there. The water was cool and refreshing. I pat myself on the back for snorkeling all the way through deep parts (where the buoys are). We didn't see turtles, but a lot of pretty fishies! 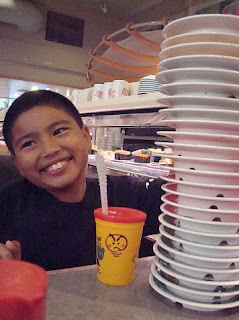 That evening, we all took a "walk" down Kapahulu Avenue to my nephew's favorite sushi place in Hawaii, Genki Sushi. It was further than Snorkel Bob's, so what a walk it was! Genki Sushi is a restaurant chain in Japan that has grown to open in Hawaii, and now one in Seattle, Washington. 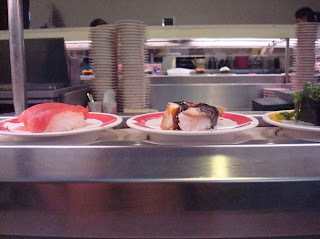 They were the first to modernize the revolving conveyor belt of sushi dishes back in the late 60's. This is what attracted my nephew - it is fun to choose what you want, and watch the sushi chefs make it in front of you and place on the moving belt. Unfortunately, I didn't take pictures of what I ate, but I enjoyed the chicken teriyaki bowl, and some traditional rolls. I remember that we were waiting for tempura shrimp to come around. Each dish has a different color, which determined the price of each one. As you can see, we sure ate a lot! It towered above my nephew's head! Highly recommended for a great sushi experience. 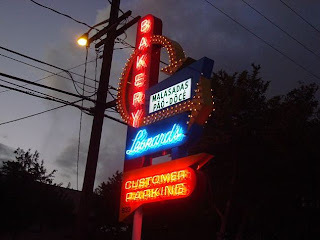 For dessert, though... it was a MUST that we go to Leonard's Bakery for some malasadas! Mala-what? It's a Portuguese dessert that's heaven. 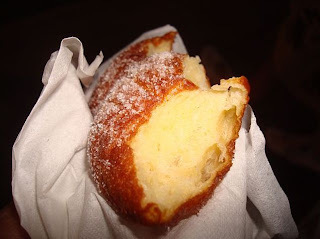 They are very similar to doughnuts because they are yeast dough balls deep fried and coated in granulated sugar. We ordered a dozen to split between the six of us, half with regular sugar, and the other half with cinnamon sugar. Oh, they were straight from the fryer because they were still hot in the box. The outside was crispy, and the middle was warm and soft. 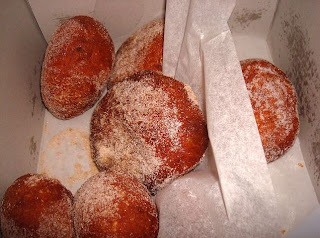 Malasadas were a great end to the day. Don't call them "masaladas" - that's what I thought they were called at first - doh! Oh, yeah.. we also had a $2.00 off coupon in one of those tourist magazines they give us at the front desk. 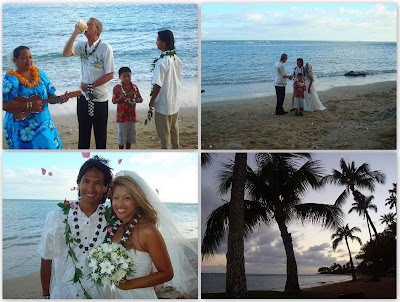 Sheila and Ron were married at Waialae Beach Park. It was a beautiful and sweet ceremony. The guests consisted of the immediate family on both sides, my aunt and uncle who live in Honolulu, and Sheila's best friend, Jennifer, & Jennifer's sister, Jill. The reception dinner took place at a restaurant at the ResortQuest Waikiki Beach hotel where we stayed. 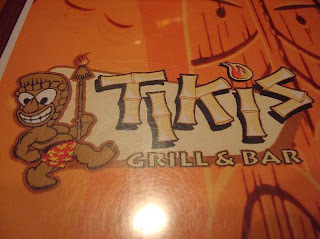 The restaurant is called Tiki's Grill & Bar. The name of the place may seem a bit "cliche" for Hawaii, but I was very impressed with the food here. Calamari Katsu... this one was my favorite out of all the appetizers. It's a calamari steak, breaded and fried in panko bread crumbs. 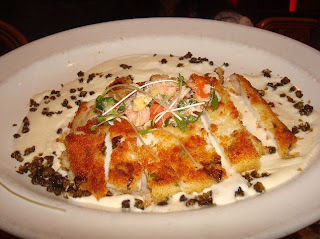 It's accompanied by a lemongrass butter sauce, fried capers, and topped with a crab & shrimp salsa. Yum! 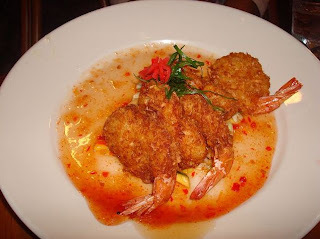 Can't beat crispy coconut shrimp in a sweet chili sauce! 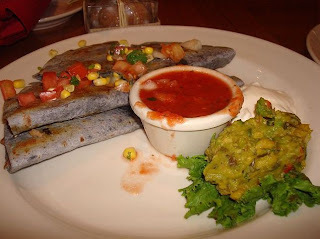 These are the kahlua pork quesadillas. They were pretty tasty, but the strong flavors of the salsas (pico de gallo & red sauce) took away from the flavor of the roasted pork. It tasted like a regular quesadilla to me. 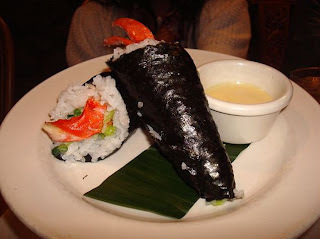 I did not have a piece of the lobster handroll (generous portion of lobster), but it was a hit at the table. The lobster is poached in vanilla butter - mmmm. Mike and I have similar tastes - so we got the same thing, which we often do. We ordered the Pan Seared Sea Scallops, which to us, is CANDY. Seared scallops are one of my favorite textures and flavors if cooked perfectly. This dish was perfection. 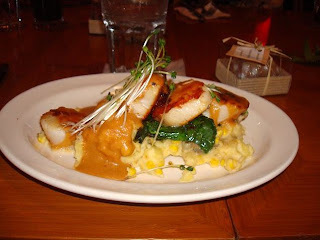 It was served on a bed of mashed potatoes & sweet Kahuku corn, sauteed spinach, and a lobster cream sauce. The cream sauce didn't overpower the scallop flavor, but it had a nice lobster aftertaste. It was like they used the lobster bisque as a sauce. No complaints there! The flavors went well together. I took the liberty and took pictures of most of the meals at the table, even though I didn't sample them. I was curious to see how the other dishes turned out. The battery did die, so I didn't get to everyone. My dad got the ginger glazed roast chicken. He ordered steamed rice instead of the truffle mashed potatoes. It came with sauteed turnips & radishes. 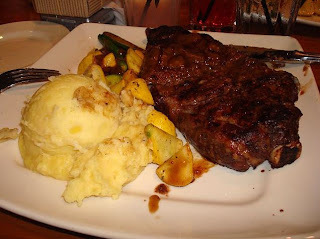 Yum, the bone-in ribeye with mashed potatoes and squash. This is something I usually would get, but the scallops called my name, and I didn't want anything heavy. This is the 8 oz. 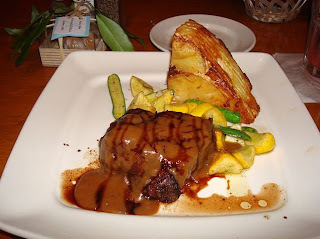 filet mignon served with a potato & goat cheese gratin and heirloom veggies. I think a few people ordered the same meal. I didn't hear any complaints at the table, and the service was great. They were very attentive and friendly. Tiki's also has a great bar and they play live music on some weeknights. We enjoy the singing voice of a local named "Corey" who we saw 5 years ago - I loved his version of "Island Style"!! The restaurant overlooks the ocean and is next to the swimming pool in the hotel. Sunday morning, after our usual Breakfast on the Beach, consisting of french toast sticks or breakfast sandwich, a mini bowl of a Kellogg's cereal like Frosted Flakes or Fruit Loops, a mini bagel with cream cheese, and a cup of kona coffee, and after the Arizona Cardinals killed the Bills 41-17 in Phoenix (Chargers lost this day to the Dolphins - boo), Mike and I decided to take a two-hour $2 bus ride up to the North Shore. Seriously, we didn't know where we going and didn't know what to expect, but it was exciting to just "go" and explore. After talking to some tourists on the bus who were confused like us, we decided to stop where they did, at Laniakea Beach to see the green sea turtles (honu). Boy, we're glad we stopped! They were adorable. 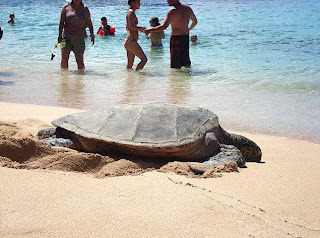 There was a volunteer making sure that people didn't get close to the turtle. This one was going back into the water for a swim. You can swim with them too, you just have to stay away a certain number of feet. So, yeah... we found out that the North Shore is BIG, and when we said we were going to walk to the next beach to find the Pipeline and that famous shaved ice place, Matsumoto's, um... no, not going to happen. Hungry without a car, we decided that maybe taking the bus to explore the North Shore wasn't the best idea. We took the bus back to Haleiwa, the town we drove through, for some grub. 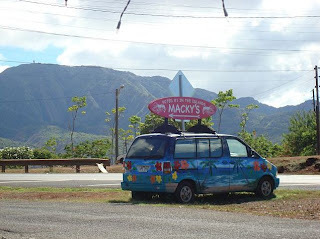 I read about a shrimp truck on Yelp.com called Macky's that we passed by as we rode towards the turtle beach. 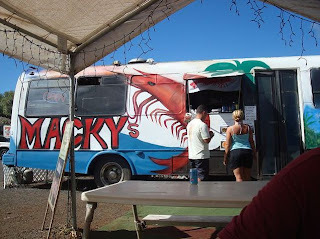 Macky's Shrimp Truck was located on a lot near a 7-11. They have about six picnic tables under canopies. The canopies are strung with lights for the evening diners. Hmm, looking at their website now, I think they changed locations because it looks like they got better picnic tables, and didn't mention that they're next to a lonely 7-11. There were random chickens running around with the little chicks too. One was asleep under a picnic table filled a bunch of kids eating - must have been really tired. We were pleasantly surprised and impressed that this shrimp truck accepted American Express cards. Wha? 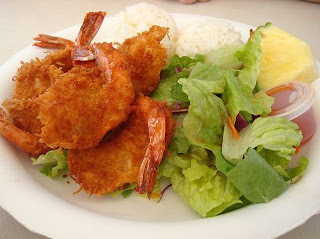 There are places in San Diego that don't even take it, and in the middle of a quiet town called Haleiwa, here's a couple of cute Asian ladies making delicious shrimp and running your AMEX card. 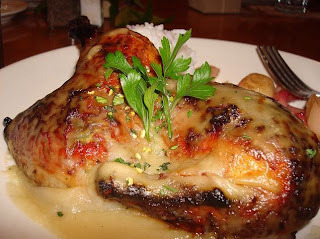 THIS was my best meal in Hawaii yet, so far. I ordered the garlic butter shrimp and it was DUH-LI-SHUS. I absolutely cleaned my plate, and seriously, I could have ordered another plate. The garlic butter shrimp are jumbo sized, cleaned correctly and thoroughly (my pet peeve at most restaurants), and served with the shells on. 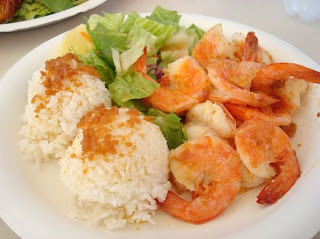 As for the garlic butter sauce they pour on the shrimp, oh man, they pour on the rice too! Even something simple, like their salad dressing... I can't describe the flavor of the dressing. It was a sweet/sour type, and was yummy. Mike got the coconut shrimp, which was still sizzling when we got it. He also got a generous large portion of fried shrimp. 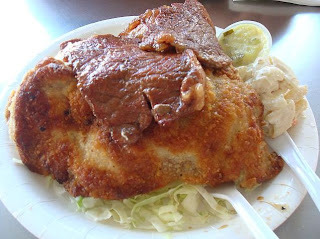 Downright our favorite meal in Oahu. We have to go back! You must visit Macky's! For all you "Lost" fans, remember Sawyer shoots a guy in a shrimp truck, thinking it's the killer of his parents? Yeah, that's the Macky's shrimp truck! 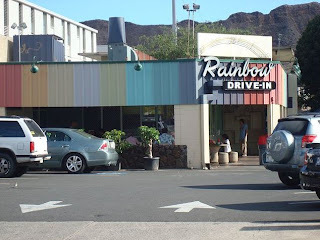 I've heard a lot of great things about the Rainbow Drive-In in Waikiki... like they have the best macaroni salad, fried chicken, and plate lunches. The rating on Yelp.com, thus far, is four stars out of five. Bring your dollars... it's a cash only business, guys. On "The Secret Life of...." (Drive-Ins) on the Food Network, host Jim O'Connor visits the Rainbow Drive-In, and eats a loco moco. Mmm...ground beef patty, gravy, and a fried egg over rice. So, I was really excited to go because even the bellhop told us that this was one of the best places to grab an authentic plate lunch! I was sold! The menu isn't elaborate, and pretty straight forward. The service was extra quick - in a wink, our food was at the counter, wow (good thing or bad thing?). I ordered the BBQ steak (teriyaki). The plate came with two scoops of steamed rice and a small scoop of macaroni salad. It's covered by the steak in the picture. Well... too much hype? The BBQ steak was alright. The steak was hard to cut into, especially with those plastic knives they give you. It was a bit chewy too. I did manage to eat half of it because it was filling enough since the portions are huge. I mean, yeah, chewy, and the flavor was OK.
Mike ordered the Mix Plate which came with mahimahi, BBQ steak, and the boneless fried chicken. It came with rice, macaroni salad, and a side of tartar sauce that did not look good at all. He ate most of it, and thought the plate was just OK too. 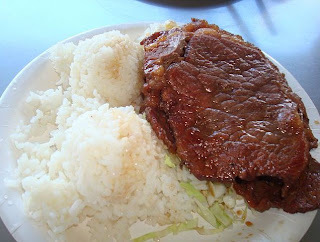 Seriously, we felt that L&L Hawaiian Barbecue and Da Kine's Plate Lunches taste way better. 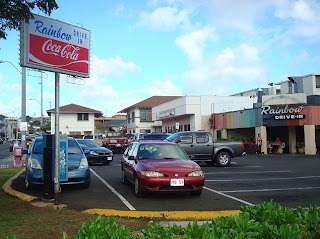 We do appreciate the family history behind Rainbow, and we will definitely give it another try the next time we are in Waikiki... maybe a loco moco or the amazing fried chicken that locals rave about. 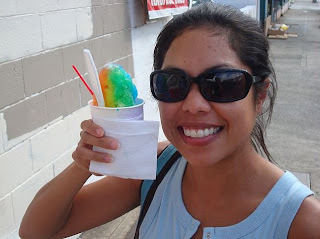 Just down one block from Rainbow Drive-In on Kapahulu, there's a shaved ice place called Waiola Bakery & Shave Ice. Apparently, this is another location - not the original located near the Honolulu Stadium State Park. We were craving a good cup o' shaved ice and since we didn't make it to Matsumoto in the North Shore.... we were like, "Hey, why not?" Creamy, shaved ice that just melted in your mouth - oh yes, that's Waiola shave ice. It was funny because we only had a few dollars cash in both of our pockets, so picture us adults staring at the menu and counting the change out of our wallets to see if we can afford a couple of shave ice cups. I remember asking the cashier lady if the cost on the menu board included the tax - HA! We were able to get the smallest size of the rainbow shave ice but still, it was a good sized portion. It hit the spot. The "rainbow" on it were different fruit syrup flavors. We didn't get creative with our choice, but hey, it was deee-lish. It was none of that snow cone type of crunchy ice that they try to pass as a shave ice, this one was smooth & creamy. It really is a hole-in-the-wall place. There were only a few people in there waiting for their goodness. It was definitely a nice surprise and treat to have on our walk back to the hotel on a cool (and final) evening in Waikiki. 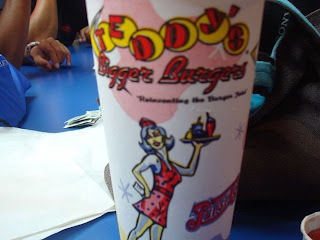 Teddy's Bigger Burgers - yum. Believe it or not, this was our second time eating here during our trip. We got take-out one evening and forgot to document it. For our last meal in Waikiki during our trip, we just wanted something quick, kick back, and delicious. Sheila, Ron, and Ron's bro, Ray, joined us for a casual, no-hassle, dinner. Teddy's is located around the corner from the ResortQuest Waikiki, but is connected to a neighboring hotel. 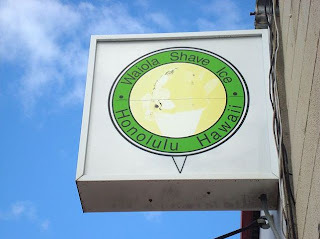 During our walking travels down Kapahulu Avenue, we noticed this place so I did research on the hubby's laptop. 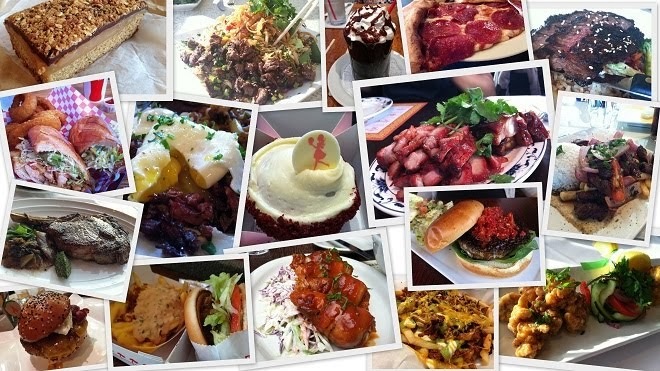 Teddy's has four locations total - three in Hawaii and one in Washington State. I have to say... they make a really tasty burger! They have a simple menu of burgers to choose from, from an original, double, teri, and spud (you'll see) and tons of toppings! 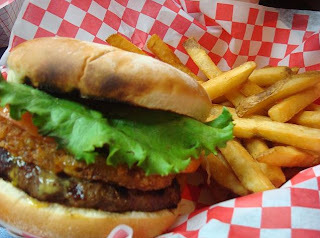 They have alternative burger meats like grilled/fried chicken, turkey burger, fish sandwich, and a veggie burger. I ordered the spud burger with cheese. It's a cheeseburger with a HASH BROWN in between. Every bite had a crunch of the crispy hash brown. It was so good. The bun also looks burnt in the picture, but it wasn't. The burger was downright delicious. 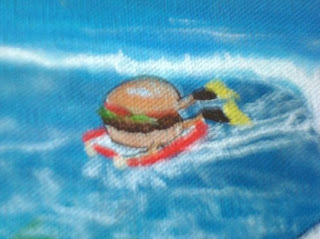 Here's a Teddy's burger boogie boarding. Cute, huh? It was on the large mural on the wall inside the restaurant. I noticed the tiny little burger so I took a picture of it. Before I end this post, I did not document eating a couple meals at the Wolfgang Puck Express located at the base of our hotel. It was very convenient for a quick and delicious meal. One afternoon Mike and I split a BBQ Chicken pizza for a snack, and another time, we treated Lani and my nephew, Jaden, for lunch before we headed out to the wedding. I had the BBQ chicken foccacia with herb-seasoned french fries. Wow, what a coincidence! I love this hotel. We will not stay anywhere else in Waikiki but here! I didn't know about Sansei or Lulu's, so next time, we're so there!